Spine Eez leg lifter pillow helps you maintain the optimum “pelvic tilt” position as you sleep, by elevating your legs. 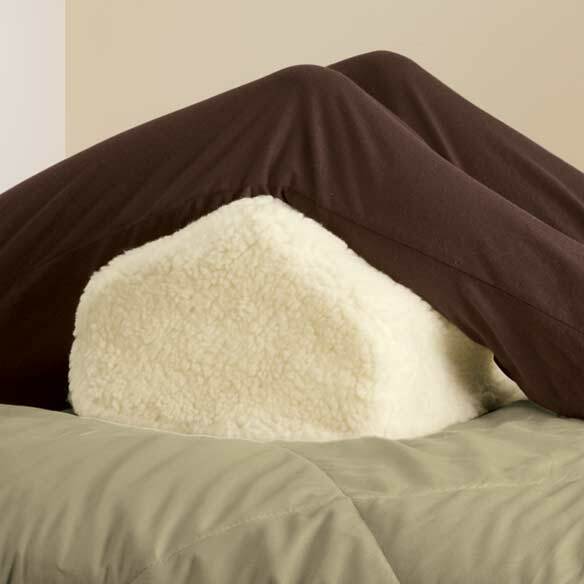 Wedge leg pillow stays secure all night, easing stress on your spine that can cause morning pain. Polyurethane foam leg pillow; soft, machine-washable sherpa cover is 90% polyester/10% acrylic. 16" x 10 1/2" x 7 1/2". a good thing n a small size! I use my leg lift pillow every time I travel, as I use a larger one at home. I was so thankful to know that now when I travel my back will not suffer and I don't have to carry my large pillow! THANKFUL!! Wished I had this years ago!!! This item is exactly what I needed to keep my knee elevated during sleep. Have had a knee replacement surgery and it is painful if I don't have support under a bent knee while sleeping. If only I would have known how much it would help, I would have bought it years ago!!!! I bought this for my wife. It has helped her leg cramps during sleep. It keeps its shape and stays put in your bed. I love this and wish I would have ordered it sooner. My legs ache at night making it impossible to lay still and with this pillow I can find a position and stay put. I really love it and will not be without one any more. Very impressed w/ it!...Very firm & just the right size! It's great for taking pressure off my back, for raising my feet, for leg support. I do wish it was a little wider. I bought this for my husband and he loves it. It helps keep his lower back relaxed when sleeping on his back and is also comfortable to slip between his knees when sleeping on his side. Also, the wedge is easy to handle when changing sleep positions. Fantastic, does what the $45-$60 does. Leg Lifter Pillow is exactly what I have needed, at just the right price. Would recommend it for any with back problems. i said all I can say, it supports my sore knees. easy to clean. I love this product for under my knees while I sleep. It is the perfect size for me and very comfortable. I have back pain issues so this really helps! I've been a side sleeper all my life but because of pain in my hips as I age I can no longer lay in that position. Yet when I sleep on my back my back aches. The Leg Lifter Pillow allows me to sleep on my back longer with less pain. I'm getting more restful sleep again. I have used this to support my injured knee at night. This is firmer than the adjustable knee support. Either is helpful for sleeping without pain. I was recovering from surgery so I had to sleep on my back to relieve the pain, I was not able to sleep on my side (my preferred position) due to incisions on my chest. This allowed me to sleep in comfort and relieve any stress on my lower back at night. As a result I got much more sleep while recovering, which felt wonderful. I used to use a pillow between my knees to help lessen the pain of my back but because I move around so much during the night, the pillow would end up at the bottom of the bed or on the floor. But this Spine Eez seems to really help. It is elevated just right to be comfortable and does a good job of TRYING to stay in place but with me moving around so much, I don't think anything could stay put with me but I still gave it a 5 rating because it really does work 100% over the pillow I was using. I can feel relief & pressure off my lower back right away using this. I put this at the foot of me bed under the covers to hold the covers up. It keeps the covers from laying on top of my feet. Helps with my hip precautions. This cushion is comfortable and right height. Very comfortable. I us it for leg exercise I just had a total knee replace. After 2 days of spinal surgery just recently, & trying various pillows, this is terrific. This has been great. It is comfortable, & helps ones position. I highly recommend this pillow. I have varicose vein n am thick woman however doesn't work that great for my leg lifting.. It is very soft and comfortable. The firmness and size is perfect. I suffer from chronic back pain, this pillow seems to help it. Thanks. This is a very nice pillow. My knees are both contratured terribly and this pillow gives comfort and support to my legs when I sleep or just want to lay in bed reading. I really can't find anything bad to say about this pillow. Purchased as a gift. Very satisfied. The height of the pillow is a little too high for my preference. This pillow is perfect for me. I can once again sleep on my back. I have severe disc degenerative disease and both knees replaced and this is a great help. Should have bought one long ago. I just wish the pillow was a wee bit wider. This cushion has greatly helped my spine and my legs, as I suffer with spinal stenoses and have had knee replacements. Very comforting for resting or sleeping with. This pillow has done what it promised - eased the pressure on my lower back while lying prone. I use it at night for sleeping, and find I don't arouse from sleep as often. I sleep more soundly, and my back doesn't bother me very much at all during the day. I've used it for 2 weeks now, and have not had that achy twinges in my back for a few days now. I am very pleased with this pillow,because of its size I was able to take along with me on vacation. i need my legs bent while sleeping because of a bead back. A wedge like this under my knees makes a big difference. I use this because I must sleep on my back most of the time and it takes pressure off my back. It is smaller than it appears and I needed to add a pillow under my calves to get obtimual comfort bur it did help with nagging pressure have at my lower back. I am using this pillow under my knees, but the wedge is a little too steep. it's smaller than it appears but it serves it's purpose...I still need to add a pillow under my feet for it to be the most comfortable but it does take the pressure off of my lower back. I think the pillow could have been a little longer....but for the money it was acceptable. It is just the right size. It is just alittle too firm. This did not help me as I had hoped it would. It's just too high for me. This product is not what it seems! I was disappointed the the product could not be used in bed. It was too light so it moved around. The cover was also marked in two places. I would not recommend this to people with real back problems. Had back surgery, need knees lifted to sleep without pain, works good except legs slip off the sides. The pillow lost its firmness within a month. It no longer has lift. It is like a hammock. Not a good buy for the money. It was just what I wanted, but it didn't work out. I am a small person of 122 lbs., so it wasn't excess weight that made it sag. Unhappy, diasppointed shopper. I found this to be the perfect shape but it was too high, had to cut it down and I found it to be too hard. A foam rubber one would have been better. I have used pillows under my legs and find that much more satisfactory....this did not give enough height and basically did not help my back, in fact made pain worse. I must sleep with a pillow under my legs because of back problems. Thought this would work but too hard. Hurt my legs so I returned it. My mother asked me to order it for her. This will help my husband back I am hoping. Recommended by physical therapist to sleep on my back due to spinal stenosis and keep legs elevated. To support my lower back and hips. Similar to what my PT uses. I"m having knee surgery and I need this for the exercises. returned this item. too wide for legs. Looks like it would help my lower back problems. Spine problem and everything I have ordered from this company has been excellent quality. Having trouble with back and tendinitis. Required by doctor to sleep on my back and need extra support. To make Mom more comfortable in bed. I have lower back pain and have been using a firm pillow to reduce the strain on my back while sleeping. However, this pillow has lost most of its firmness so I am hoping that this leg lifter pillow will work well in eliminating my back pain after a night of sleep. I hope this will ease the pressure on my back when sleeping. To help decompression of my spine. For husband,to ease his back pain. Recommended by physical therapist to ease pressure on lower spine. To relieve lower back pressure when sleeping on my back. My daughter needs it in bed as she is in a wheelchair daily and can no longer straighten her legs. to help alieve pain in knee. it helps somewhat. I have had back surgery, and just a pillow under my knees does raise my hips high enough. This item really helps . i have swelling in my legs and feet daily and ths will be more convient than trying to stack pillows under my blankets. What is the height of the pillow at the point of the peak where the knees bend? BEST ANSWER: Thank you for your question. The pillow measures 16" x 10 1/2" x 7 1/2". We hope this information will be of help to you. Is it 71/2 inches high or 101/2 inches high? BEST ANSWER: Thank you for your question. It is 7 1/2" high, 10 1/2" wide. We hope this information will be of help to you. do you sell covers separately for this item? BEST ANSWER: Thank you for your question. Unfortunately we do not sell replacement covers for the Leg Lifter Pillow. We hope this information will be of help to you.